The online presence of your law firm is a vital piece of the marketing strategy of an attorney. 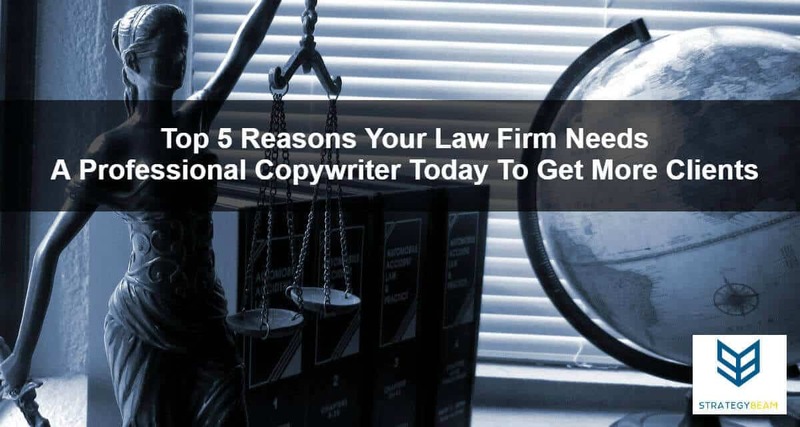 And when it comes to the visibility and overall marketing success of your law firm, there is nothing more important than exceptional copywriting to hook your customers. Copywriting is an essential part of attorney marketing strategy. The quality of copywriting is even more important for law firms just because of the industry, competition, and client base. Your law firm is not a coffee shop, and your clients are not “the average Joe.” You want to attract the right customers and set expectations right away so you can grow your practice and make more money. Search engine optimization is the number one way to organically get linked to potential clients online. Each time your prospect searching for something in Google, they use a search query with keywords and other questions. The question is, do your clients care about the first ten search results on Google, or will they take the time to read through the rest of the 999,990 results? You can boost your law firm to the top of the search results by using PPC marketing strategies for your law firm if you have the budget and knowledge to grow your Organic SEO tactics. Your firm won’t survive if your potential clients can’t reach your website. Your law firm provides quality services that your potential clients need, so you need to do whatever you can to rank high on the first pages of search engines. An experienced copywriter knows how to create content for your law firm website that ranks well in search engines, engages your readers, and gets you more paying clients. You need to focus on is solving cases, whereas your copywriter will take care of all the law firm-related content writing that needs to exist online. Admit it; there are tons of products every day that you buy just because you love their taglines. From “I’m Lovin’ It” to “Open Happiness,” there are a number of slogans, taglines, visual content or pretty much any content that creates the difference for many users. There’s no denying the fact that content hooks the customer. It’s been happening for as long as people have been communicating, and it will continue to happen forever. Sometimes, law firms think that the marketing for a law firm is different than regular products, but in reality, the same overall marketing strategy applies to attorneys as it does to restaurant owners. A professional law firm copywriting can deliver polished content that will not only read great for your audience but is also personalized to their needs. A professional copywriter will also help your law firm build a lasting brand and increase conversions, so your firm will benefit in many ways by publishing great content! No matter how much you want to run away from the fact, it wouldn’t change the reality that content is the fuel that drives a successful law firm SEO strategy. No matter how amazing your services are, if you don’t focus on your content, you won’t be able to expand your clientele. From identifying your customer profile to writing content that your clients want to read, there are many factors that a copywriter focuses on to get you potential leads online that you can soon convert into paying customers. The better your content, the better your online presence. You can use advanced PPC marketing strategies with great Ad extensions for your law firm to get found online and drive more qualified clients to your site. Sure, there are hundreds of other things that your online presence and success, but content plays a significant part in all those factors too. This makes it even more important for your law firm to produce awesome content that engages and converts your readers today! Yes, you might know how to make small talk in parties or business meetings, but do you know how to establish and grow relationship online? Sure, you can write amazing case studies for all the success of your firm, but what good are those case studies when you can’t hook your customer enough to reach it? Building a relationship with your readers is quite different than building a relationship in a face to face meeting. There are hundreds of things that you need to focus on before reaching your customer, from the brand tone that you are using to the points that you’re focusing on, even the small areas in your copy that contain a large business idea hidden behind the words. These are the small conversations that a copywriter can make through content but a business owner can’t, especially a business owner that is associated directly with a law firm. A professional law firm copywriter understands various aspects of business marketing, and they should know first-hand how to grow a business. This is why they focus on creating content that suits the business and nature of law firms while keeping the budget of the law firm in mind. It’s safe to say that a copywriter might just be the perfect addition to your team and the best investment that you can make for your online existence to grow. There are still tons of areas that you need to focus on when we talk about law firm marketing, but law firm content writing tops the list. All in all, it’s easy to understand how vital a copywriter can be to your law firm marketing strategy. If you are ready to bring your law firm marketing strategy to the next level then fill out the form below and we will be in touch with you ASAP!